Attractive twenty-something acrobats flying through the air to Radiohead? I suppose there are worse ways to spend a Wednesday night. 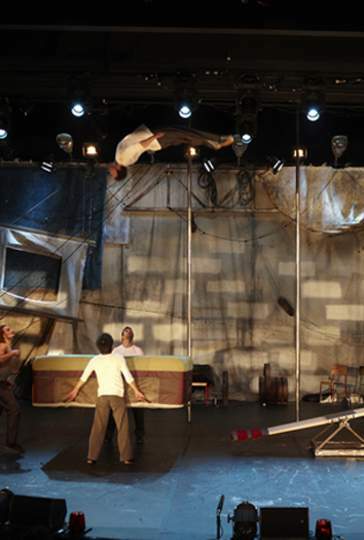 This is Traces, the current show from Les 7 doights de la main / The 7 Fingers, billed as "the world's coolest contemporary circus company." For once it might not be hyperbole; Traces is a laid-back, stylish and fashionable show filled with feats that conjure up constant involuntary gasps. In recent years, acrobatics shows seem to have banished sequins, tights and vaseline smiles in favour of earthy, low-key authenticity. Autumnal pastels, natural fabrics and indie rock are the name of the game, all part of a mission to ground the acrobats as regular people (doing amazing things). The implication being that, crazy though these feats are, with enough practice and dedication you or I could be twirling majestically through the air. This crusade to get the us to identify with the performers means they can't just be stony-faced acrobat-automatons, they've got to be likeable. Fortunately, The 7 Fingers have a surfeit of charisma - their personalities practically radiating off the stage throughout the performance. For most of the first part of the show their individuality is repeatedly underlined. They introduce and describe themselves, giving us a potted history of their lives to date. Then, as if competing for our attention like naughty children, they barge and jostle amongst each other for the spotlight. At times they even square off against each other and for a brief moment, it seems that fists might fly in annoyance. This makes a decent chunk of Traces weirdly melancholic, a peculiar contrast to the intense physicality of the performances. This all feeds into a subtle psychic misery that suffuses the cast - are these flips, dives and tumbles a manifestation of some inner woe? After all, who hasn't been so annoyed that they've felt like they're climbing the walls? By the time they're climbing poles to Radiohead's dour masterpiece Talk Show Host (with the repeated refrain "I wanna be someone else") you pray they're going to snap out their funk. They do - if half of the show shows insecure jockeying for attention, the other fuses the company into one organism and develops bonds of trust. Perhaps the clearest example is when a giant see-saw is produced. With two cast members perched on a scaffold, a third stands opposite them. The two jump down onto the see-saw, propelling the third into an impossibly high parabolic arc. As he spins gracefully through the air, the rest of the cast catch him on a large cushion, which he hits with a satisfying *thump*. The slightly depressive mood of the first half makes these explosions of energy that much more uplifting. It's this carefully considered emotional core that sets 7 Fingers apart from the rest. Sure it's awe-inspiring to watch someone bending their body into a gravity-defying pretzel high above a hard stage, but it's even more intense when you genuinely care about that person. Even without all that on top, the simple skill in Traces would make it a more than worthwhile watch. Just watching someone put their body through this, firing themselves through tiny hoops with laser-guided precision or doing a mind-bogglingly complex diabolo routine. My personal favourite bits were the aforementioned Radiohead routine, the pleasing-to-the-eye 'Cyr Wheel' and an awesomely cool, gymnastically excellent segment set to UNKLE's Burn Your Shadow. It's difficult to imagine much else topping this in terms of circus in London this summer. A wonderful watch from start to finish, topped off with heaping dollops of élan. Recommended. 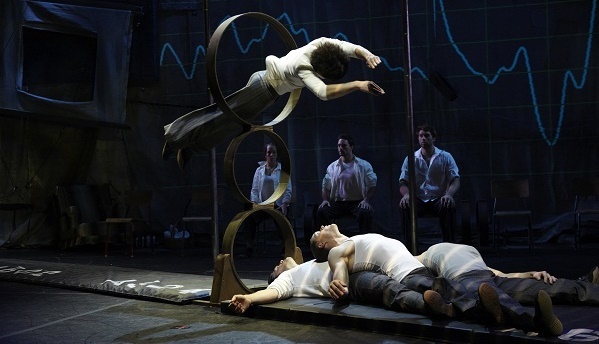 Traces is at The Peacock Theatre until 12th July 2015. Tickets here.